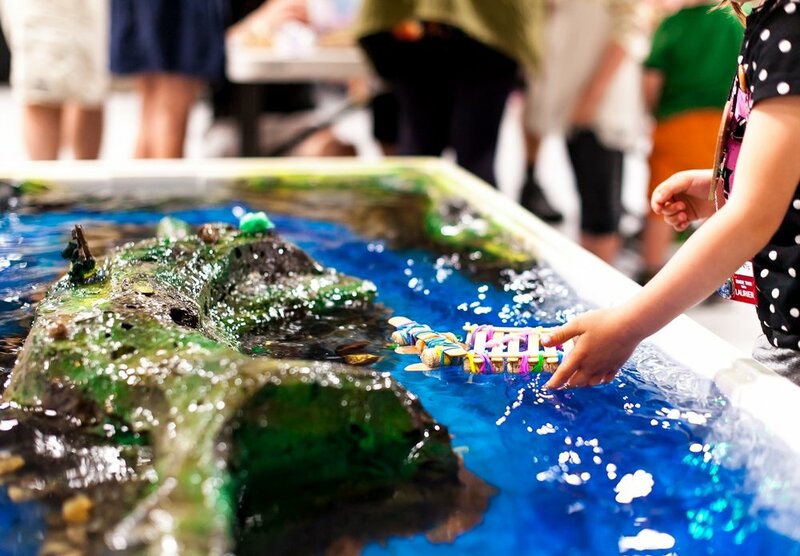 Our portable river is the ultimate water table. Kids as young as two love playing with the river and designing boats out of popsicle sticks, corks, foam bricks, and elastics and then sending them down the river. As an educational experience, we offer children various challenges ranging from getting a toy animal down the river safe and dry to building stable boats with fewer and fewer numbers of pieces. The core of the activity is the design loop: Design, Build, Test, Learn, Redesign. Kids spend hours challenging themselves and each other to solve ever crazier problems with very specific constraints. The river supports up to 30-60 kids playing at one time depending on their age, our staffing, the environment and other factors. Geek/Site Specs: The river is 1.25m x 3m (4×10′) and uses 250 liters (70g) of water in a recirculating loop at ~22,000 liters per hour (6000 gph) when operating a full capacity. It is GFI protected and needs to be setup outdoors within 200′ of a garden hose spigot (or other water source) and 150′ of a standard 120v electrical outlet. * Due to the setup time involved for the river, we now only book the river for two or more classes/groups at a time. Two classes are included in the first $450. For three groups the cost is $675 and four groups is $900. For higher volumes in a single day please contact us.